In a hurry to get these up so I'll be brief. At 10:30 this morning I spotted this stunner at the Windsor-Bloomfield Landfill in Windsor, CT. My first glimpse was only ~10 seconds long, but I was able to relocate the bird about 20 minutes later (felt more like an hour...). 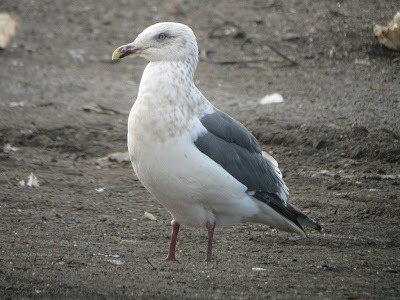 Tentatively IDed the bird as a 4th-winter Slaty-backed Gull and made a few calls. Birders were on their way, and in the meantime I was finally able to view the wing pattern, which clinched the ID as the state's first SBGU. As always, click images for larger views. My apologies, as many of the shots here are overexposed thanks to me just using the Auto feature of my p&s camera. This makes judging shades of gray in several photos rather difficult. Note the "eye shadow" look, pale eye, broad tertial crescent, dark gray upperparts, and pink legs. One can see here how the streaking becomes blotchy and warmish brown on the upper breast. Also gives an accurate depiction of the wing-tips that do not extend far beyond the tail at rest. My only flight shot. Really bleached out by the bright sun...but gives a good idea of the upperwing pattern. SBGU at rear, one of the smaller Great Black-backed Gulls in the foreground. This bird was much closer in size to GBBG than HEGU. Larger than every HEGU on site. Note difference in leg color. Note here the pot-bellied look, in addition to the features mentioned above. Another shot of the bird's girth, and the blotchy brown across the upper breast. SBGU partially obstructed by GBBG. Compare mantle color. A look at the nape. 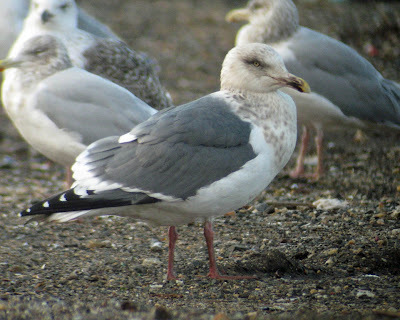 There was also a similary-aged Lesser Black-backed Gull present. 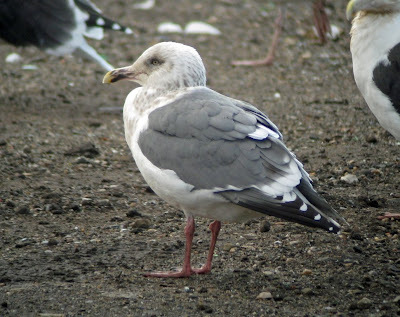 For those going to look tomorrow without much experience with these gulls, watch out for this LBBG, which could conceivably cause confusion. Unlike the SBGU, this LBBG is slim, long-winged, with yellowish legs. This LBBG has less streaking on the neck and upper breast than the SBGU. The streaking here is fine, not blotchy. Slim, small, longed-winged, and yellowish legs. But note how similarly-patterned the bill is, as compared to the SBGU above (both are mottled black and yellow). View of the nape (compared to SBGU above). Another look at the yellowish legs. 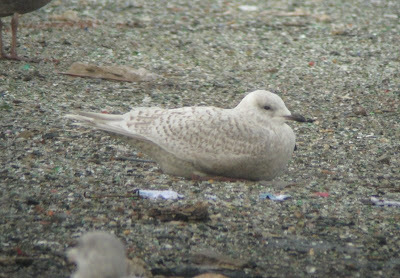 There were 4 Iceland and 3 Lesser Black-backed Gulls tallied throughout the day. Total gull numbers were somewhere around 2,000+. Lesser Black-backed facing left, Iceland facing right. Nick you old dog! 2 Days and two great birds - talk about upstaging the King Eider. Congrats - what an amazing find and just reward for the work you put in up there. Man am I regretting not coming out with you today! You've gotta be out to be lucky! You really cracked a good one today. Your timely phone call was much appreciated - my parents and I all had great looks at your bird. Most impressively, this is a great find for the CT River Valley and a 'mega' for interior New England. Nice job indeed. Wow - what a great spot! Congrats on finding the state's first! Excellent post too. Thanks for shaing all the details. Congratulations Nick!!! That's a great looking bird. I also feel that the SBGU bill shape is pretty distinctive and pretty obvious in these photos. Thanks guys, felt good! That dump isn't the largest but it delivers some nice gulls...usually allows for nice views of them too. Looking forward to getting back there sometime in the next week or so. 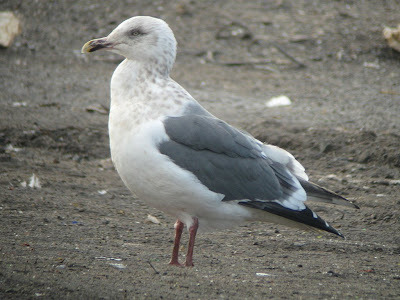 hi ...great pics of that gull..i need a good gull id class..yikes...how in the world did you find that in all those gulls..
anyway i dont know if your and brownstone birder know each other..but he has some video of the bird on his blog today.. Dawn, thanks so much for pointing me to Larry's video. Very nice! I hope I don't have to pay you royalties on that video. Congratulations on another great find! We'll be looking forward to the next one. for getting the message out so quickly. With your new iphone its a breeze isn't it?